The second in a series. Last time, we left our hero after he had accidentally picked a favorite team. He had not yet opened a pack of cards, and to be honest, had no idea that cards existed until one fateful night. The year was 1986. My dad was a High School teacher and took the family to see some stage production of Peanuts. I tried to find a copy of the program online, but to no avail. My memory of the play is vague. I remember it being cold outside and dark inside and not in an actual auditorium (my dad later confirmed it was in the cafeteria). I have the feeling we were in the front row, but I also don’t think too many people were there. I also remember thinking to myself (and maybe out loud) something along the lines of why would they make a play out of Snoopy and Charlie Brown? Why was I not watching the cartoon? Needless to say, I was bored. My brother was probably bored. It was a high school play with a guy in a dog suit for crying out loud. It was probably a musical to top it off. I never was the biggest fan of Peanuts to begin with. It was alright, but just not silly enough for my taste. I think my dad sensed that he was losing us. My dad left us with my mom during intermission and then came back with something in his hands. He handed me and my brother a pack of baseball cards. 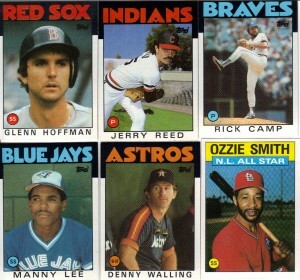 1986 Topps baseball cards. Mint in package 1986 Topps baseball cards. Yup. All these guys played baseball at some point. That's about all I can say about any of them except Ozzie. Note: Not the actual contents of my first pack. I had no idea what I had in my hands. I didn’t fully grasp what it was I was opening, but I knew that I liked it. I didn’t know who the players were. I didn’t know what team was what or where they played or against whom. All I knew is I was handling a new addiction. A lot can be said (and has been) about this 1986 set and the design, but to me it’s infallible because it was the Alpha. This pack and this set was responsible for making me a baseball fan. 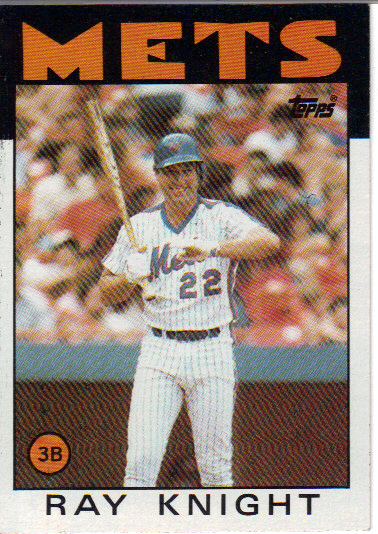 The first goal was to collect all the Mets cards. Not to be confused with Ted Knight (who died that year. What a sad caption this turned out to be). Then, the world. My brother and I worked together to come up with the entire set. I don’t remember if we actually accomplished that goal, but I have the feeling we did. Of course once that set was finished, it was on to the next one. And non-sports ones, and it spiraled on and on and on…. I love the 1986 design. I love the design of most of the cards from the ’80s. 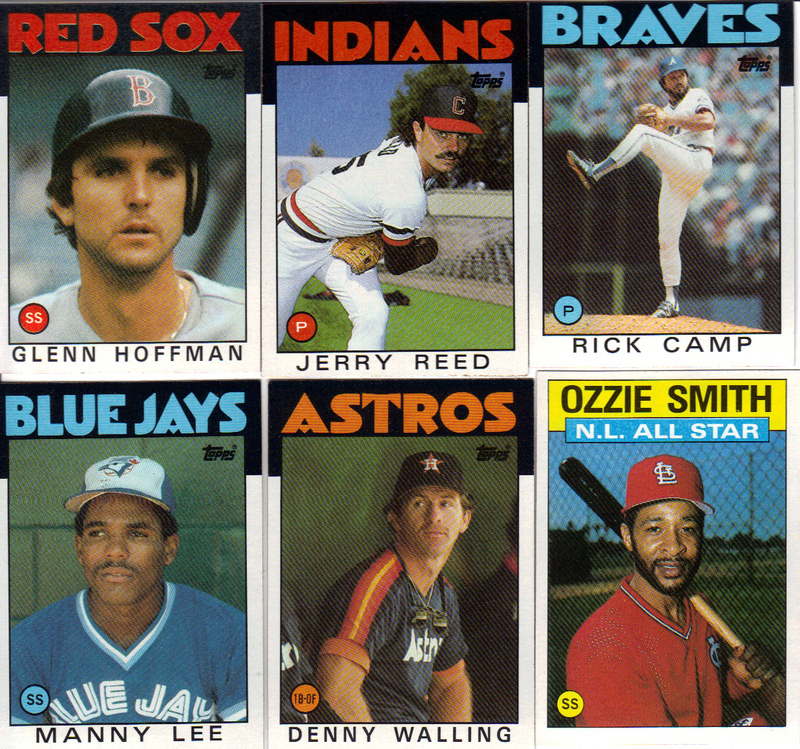 In fact, since Topps now has a monopoly on baseball cards, I wish they would start ANOTHER annual Heritage set, this time starting with the design of the 1980 set. That design is friggin’ classic. I really do think it would be a good idea. I’m 37 years old, so I can’t really relate to the “romance” of the designs from the ’50s and ’60s. At this rate, if they keep doing one set of Heritage a year, they won’t hit the 1980 design until 2029. I’m impatient, and there’s no way I can wait that long! Heck, call it something other than Heritage, but let’s start doing reprints of 1980’s card. Who’s with me? I think you and I are in the minority, but I agree that starting up the 80s Heritage would be great. Maybe they could jump around a little bit and not do each consecutive year. Instead of ’62, go to the ’71 next year and then to ’84 or something. Mix it up a little bit. They’ve done things like Archives and Fan Favorites incorporating those designs. I’ll go for something like that again, because that was in my non-collecting period. I’d put together a whole set based off of the ’87 wood border. I can imagine the Starlin Castro Future Stars card now. Funny you should mention the ’87 wood border set. That was the first set I ever collected. The elusive Chuck Tanner: Braves Manager was the last card I needed. The day I finally traded for that card was a great day, indeed. I would LOVE it if Topps would do a set that looked like those bad boys, but with a glossy finish. Michael Eisner, are you reading this??? 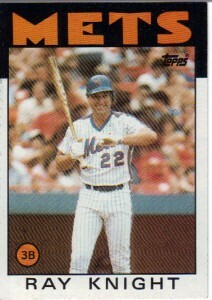 the sabo was in 89 topps. a good card to get at the time.